Regular records on Bardia’s history began in the 1960’s when 368 sq kms were set aside as royal hunting grounds. In 1982 the area was official named “Royal Bardia Wildlife Reserve”. In 1984 it was joined by the Babai valley which combined is what we have today. Bardia contains countless deer who are the primary source of food for the tiger population. While river fish are a major source of food for the 250 plus types of bird found in the area. Bardia’s largest attractions are also it’s largest inhabitants. Tigers, elephants and rhinos take pride of place here. But don’t rule out the huge amount of deer, jungle cats (including rare leopards) and monkeys that you might bump into! Here is my full online guide to Bardia National Park. Meanwhile the rest of this page will deal with transport to Bardia. Bardia National Park and Ambassa are beside each other. Chitwan is the huge jungle where treks and jungle safaris take place. Ambassa is the small roadside stopping point directly outside of the National park. This is where most buses stop to let people off. From here you go to Thakurdwara. Thakurdwara is the nearest village to Bardia National Park. It's about 40 minutes drive from Ambassa. The village contains a few shops, cafes and a bus stop that goes to/from Kathmandu. There's a small temple here and the road south leads to most of the resorts. The nearest airport to Bardia National Park is Nepalgunj Airport in Banke district of the Bheri zone in Nepal. The flight takes about 50 minutes. 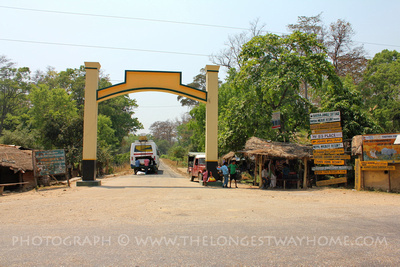 From here you have to take a bus of Jeep to Bardia which is 3 hours away (5,000 rupees). Plane tickets to Nepalgunj are available from nearly all travel agencies in Kathmandu. Flights run daily depending on numbers. Off season flights are frequently postponed until the next day. Prices are approximately USD $200. Bus travel to Bardia is by far the most preferred method. There are several options. The two most popular are to take a bus to Ambassa or direct to Thakurdwara. The direct bus to Thakurdwara started in 2018 and leaves from Kathmandu's Gongabu bus park. Book the day before. Departures are usually around 4-5pm. Ticket prices are about 1700 rupees. This bus can be canceled on occasion. This bus has a little more seat room than the other types of bus. The more common type of bus leaves from Gongabu at more regular times from 1pm to late to Mahendranagar. So it's important you ask for a Mahendranagar but then tell them you will get off a Ambassa. The cost is about 1,200 rupees. Again, you need to book a seat the day before. Journey time to Bardia is about 13 hours in both cases. Both buses stop during the night for food and toilet breaks. They usually arrive between 4am-5am (so it helps to have someone waiting for you). Please see below important details about arriving in Ambassa. You could hire a private jeep and driver to take you to Bardia. It will likely cost in excess of USD $250 give or take the odd fuel crises. You can fly from Kathmandu to Nepalgunj (40 mins) for about USD $125. However flights are not always regular. Buddha air runs one of the more favored routes. From Nepalgunj your resort will often offer to pick you up (for a price USD$50-70) for the 3 hour journey. You can also take a bus from Nepalgunj to Thakurdwara for about 100-150 rupees which takes about 3-4 hours. However do note that buses depart only around 11am and at 2.30pm. Otherwise you can take a more regular bus from Nepalgunj to Mahendranagar and get off at Ambassa. 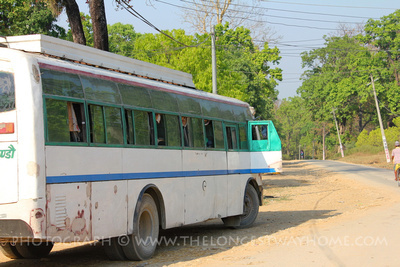 Daily buses from Pokhara to Mahendranagar (Near Ambassa) leave from Pokhara's old bus park at 3pm. The journey time is 12-14 hours. Tickets are best bought in person the day before. They cost about 1,400 rupees. There are buses leaving from Mahendranagar later at night but they are not as comfortable and have frequent stops. There are no direct buses from Pokhara to Thakurdwara. If you are visiting Lumbini and are okay with local transport then you could shave some time of your visit to Bardia by starting from here. From Lumbini Bazaar you will need to get to Bhairahawa bus park. At Bhairahawa take a bus going to Butwal (3 hours) From Butwal there are many daily buses to. Mahendranagar but drop at Ambassa. The journey time is about 8-9 hours. Most buses will stop en-route to Mahendranagar at Ambassa at about 4am! So it will be dark. You will only have a few choices here so plan ahead. Prebook a pickup from a resort. This is the most popular choice. If you prebook a pickup then there will be someone there to meet you no matter the time you arrive. Before departing for Bardia they will ask you your bus company name and seat number. It's helpful to have a Nepalese SIM card to stay in touch with them but not necessary. Arrive and find a lift: There are usually people at the bus stop every morning from resorts offering lifts. But this is not a guarantee. Neither is the type or standard of resort. In all cases they will be wanting you to stay with them. Bargain hard, try to find their resort on a map first. Agree on a price to Bardia National Park before setting off. Keep in mind it will be around 4am. With the second option you do not need to stay at the resort the driver comes from. Prices are usually 800 rupees for a motorbike lift or 1000 rupees for a jeep lift. The journey time is about 40 minutes. It is not advisable to try and walk to Thakurdwara due to dangerous wildlife in the area. There is a local bus from Ambassa to Thakurdwara but it's not regular and is only twice a day. If you only get a lift to Thakurdwara and want to visit some resorts before staying in one keep in mind that the resorts are spread out. If you have heavy luggage this is highly impracticable. If you just have a light day bag then you could just about manage it so long as you have the location of some good resorts close to each other. These are listed in my guidebook to Bardia. Otherwise feel free to contact me for the name of the resort I stayed at to pick you up. Are you looking to discover more about Bardia National Park? Look no further as I've written the most comprehensive travel guide to Bardia!